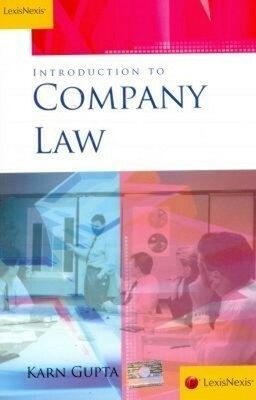 Introduction to Company Law is a brief analysis of the Companies Act highlighting the basic concepts of formation and operation of a company, incorporation and other incidental matters, mergers and acquisitions, the institution of directors, doctrine of ultra vires, indoor management and corporate veil, winding-up, share capital and debentures. The book also discusses the Companies Act, 2013 in brief and how it is different from its predecessor. • Inclusion of case summaries of international as well as Indian case law to make the reader understand the significance of each and every topic; • Each chapter contains Learning Objectives and Points to Remember for quick reference which will be beneficial for students during exam preparation. This book will be a ready reference for law students, research scholars, and students pursuing professional courses like Company Secretaryship, Chartered Accountancy as well as for legal practitioners.